It may seem a new destination, but our Myanmar bike tours have been running for well over a decade. In 1999 we were the first North American company to set up shop and organize trips in Myanmar and have since hosted hundreds of delighted travelers. It was so difficult to get travelers to come, we nearly packed it in. Of course, Myanmar is now first on everyone's bucket list. What's to know? Our tours feature small groups, meticulous preparation, imported Trek bikes, tropical jungle rides, few tourists, enchanting ruins, warm welcoming smiles, rustic villages, magnificent ruins, delicious meals, and tranquil roads with no traffic — high adventure! 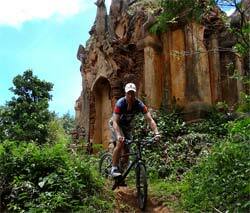 Come cycling through Myanmar in areas closed off to travelers for over the last forty years. Our Myanmar cycling trips are not limited to the classic route (below), but always changing and organized to your preferences. We love the festivals, join us in Inle for the Fire Lighting in November or traditional boat racing during the Phuang Daw Oo festival (Myanmar's largest), in mid to late October. We have a handful of group departures below, but most of our trips are private, custom ones. See our calendar below for seasonal Myanmar tours or if four or more people, consider a custom, private tour. Our Myanmar bike trips can be customized to your preferred dates and travel preferences such as the amount of riding and other activities you may want to include, like photography. If you're considering Butterfield & Robinson tour, our longtime competitor in the region, we provide a compelling alternative with more comprehensive itineraries, higher-quality hotels, immersive activities, people-to-people focus, emergency medical and evacuation (no, they do not provide this), and of course, the very, very wonderful experience of a completely custom and private tour for about what their group tours cost. Call B&R and then call us at (415) 731-4311 in San Francisco to see who knows their stuff more. September through February is ideal weather-wise, and the other in November dates coincide with the Lights and Taunggyi Hot Air Balloon Festival or the Inle Lake Paung Daw U Festival. Outlier months you may have read are undesirable, such as June, can actually be fine, and free of other tourists. For example, Inle Lake, with the finest cycling in Myanmar, is pleasant in June while other parts of the country are hotter but tolerable. Ask us about your dates. Cycling days average about 15-55 miles (89km), on roads and dirt paths of poor to fair quality (mountain bikes with shocks recommended, although we now have Trek hybrids available). Small group of your own? 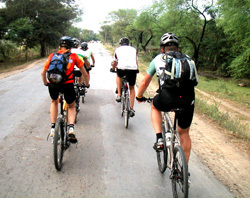 After Vietnam, our Myanmar bicycle tours are our most popular private, Myanmar custom biking tours. We have organized our trips for families with small children to ex-professional racers, but most of of are tours are leisurely trips for couples and small groups of friends, emphasizing local culture and personal encounters. If you're simply an active traveler, we can mix canoeing, cycling, and trekking into a trip (plus some vigorous strolling around Yangon). 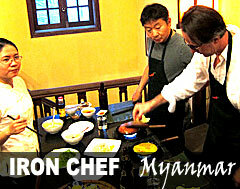 Our popular Iron Chef culinary cycling tour comes to Myanmar! Join us for this once in a lifetime culinary journey. Last organized in September, 2013. 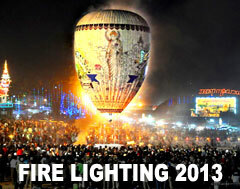 Myanmar's largest and most spectacular festival, the annual Fire Balloon Lighting Festival in the Shan State. November, 2014. 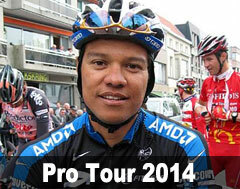 A special Fundraising Pro Tour with US Pro Tony Cruz, Olympic and 7-11 rider John Brady, and English National Champion Dennis Lightfoot. Our "classic" Myanmar Biking Tour Itinerary is below [click to see the full Detailed Itinerary], although like our Vietnam tours, most our Myanmar cycling trips are customized, private trips for couples, small groups, and families with children of all ages. Tours of one to four days in and around beautiful Inle Lake. Pagodas, floating islands, monasteries, wineries, boating and much more. Suitable for all ages and abilities. Please contact us for more details about this one-of-a-kind Myanmar cycling experience. "How fabulous our Myanmar trip was! Quite honestly, it surpassed my expectations in almost every respect. Prior to arriving I had some concerns about the level of oppression we would see and feel from the government forces (there was hardly a trace), the food (it was wonderful! ), and the accommodations (they were nicer than places I normally stay in the US).